The dalet. the poor man, receives charity from the rich man, the gimel. The word dalet means "door." The door stands in the opening of the house, the beit. In the Zohar, dalet is read as "that has nothing [d'leit] of her own." This expresses the property of the lowest of the Divine Emanations, the sefirah of malchut, "kingdom," which has no light other than that which it receives from the higher sefirot. In man's service of God, the dalet characterizes "shiflut," "lowliness," the consciousness of possessing nothing of one's own. Together with the awareness of one's own power of free choice, one must be aware that He gives you the power to achieve success, and not to think, God forbid, that one's accomplishments are "my power and the strength of my hand." Any achievement in this world, particularly the performance of a mitzvah, the fulfillment of God's will, depends upon Divine aid. This is especially true in one's struggle with his evil inclination, whether it be manifest as external passion, stubborn resistance to accepting the yoke of Heaven, or laziness, apathy, and the like. As our Sages teach: "If not for God's help he [man] would not have been able to overcome it [the evil inclination]." The Talmud describes a situation where one man is carrying a heavy object and another man appears to be helping him by placing his hands under the object, when in truth the first man is carrying all the weight. The second man is referred to as "a merely apparent helper." So are we, explains the Ba'al Shem Tov, in relation to God. Ultimately, all one's strength comes from Above. Free choice is no more than the expression of one's will to participate, as it were, in the Divine act. One merely places one's hands under the weight carried exclusively by God. "For to You, God, is kindness, for You pay man in accordance with his deed." The Ba'al Shem Tov observes: Just payment in accordance with one's deed is not an act of kindness (chesed), but rather one of judgment (din)! He answers: "in accordance with one's deed," can be read "as though the deed is his." Thus God's ultimate kindness is His enclothing the "undeserved" reward in the guise of deservedness, so as not to shame the receiver. The Name of God in this verse is Adnut, the letters of which also spell in Hebrew dina, "judgment," implying the Divine guise of judgment, through which God's kindness (chesed) is most fully expressed. The Zohar reads chesed as chas d’leit, "having compassion [on] the dalet," i.e. he who possesses nothing of his own. In regard to an arrogant person God says: "I and he cannot dwell together." The door to God's house allows for the humble of spirit to enter. The door itself, the dalet, is the property of humility and lowliness, as explained above. 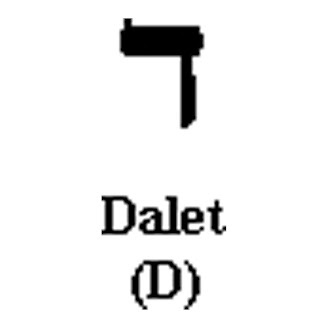 The dalet is also the initial letter of the word dirah, "dwelling place," as in the phrase "[God's] dwelling place below." Thus the full meaning of the dalet is the door through which the humble enter into the realization of God's dwelling place below. Two lines forming a right angle, with a corner point. A man bent over. Three levels ofbitul. The corner point: Consciousness of the ego. Every creature's unconscious awareness of its continuous re-creation by God. Collective consciousness; willingness to sacrifice one's life for one's people. The horizontal line: submergence of the soul in its Divine Source. Bitul Bimtziut Mamash; "Prostrating wide." Letters being surrounded by white parchment. Willingness to sacrifice one's life for God. Door; poor man; lifting up - elevation. Door--bitul, the entrance way to truth. The servant who refuses to go through the door of freedom. True lowliness of the soul. The moon as a symbol of the soul. The elevation of the soul by God into Himself. "I will exalt you, God, for you have lifted me up." Not belonging. Four elements of the physical world: fire, air, water, and earth. The four physical forces: gravity, electromagnetic, strong, weak. Man, animal, vegetable, and inanimate objects. Four seasons of the year; Four directions. The four worlds: Atzilut, Beriah, Yetzirah, and Asiyah. Four matriarchs: Sarah, Rebecca, Rachel, and Leah. Jacob's four wives: Rachel, Leah, Bilhah, and Zilpah. The four expressions (levels) of redemption. Four feet of the Divine Throne: Abraham, Isaac, Jacob, and David. Father, mother, son, daughter: the first commandment of the Torah: "be fruitful and multiply." Four letters of God's Name. Four components of the Torah text.